Life was pretty simple when I was 22. My only responsibilities were my job, my boyfriend and a family who made few demands on my time. This gave me the opportunity to be completely single-minded when it came to my big life goal at the time … competing at an elite level in my sport of triathlon. And single-minded I was. I dedicated 15-20 hours a week to training and racing, and probably another 15-20 hours a week to thinking about training and racing. You can turn big goals and dreams into reality pretty quickly when you’re able to be so focused. You get to write plans and set mini-goals and be really strategic about everything. You get to do all the little one percenters. You pick up quickly when and where things may be going awry and make the necessary adjustments in a heartbeat. In short, you get to leave no stone unturned. When you’re a highly driven, goal-oriented, compulsive striver like me, this is the stuff dreams are made of! But what happens when you’re that person and suddenly you don’t have that kind of time on your hands? What happens when you’re a mother of two, wife of one, business owner, writer, blogger, short order cook, laundress and household logistics manager? Do you just give up on ever achieving anything ever again? 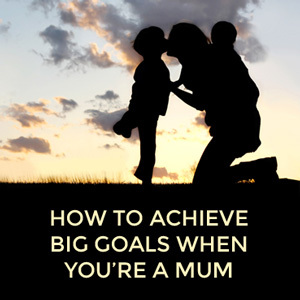 Do you pack away your goals and ambitions until your kids have moved out of home? Or at least till they’re old enough to not want to talk to you anymore? No, of course you don’t. You just have to approach things in a very different way. This has perhaps been the hardest thing for me to come to terms with. My whole life, if there was something to be gone after, I went after it. There was no need to be selective. No need to prioritise. These days however, it matters little how awesome an idea is or how desperately I want to work with someone. There’s just no time to chase every bright, shiny object that crosses my path. The lack of time on my hands has forced me to zero right in on the one thing I want the MOST. And that thing is building a name as a writer. This is the thing that gives me the greatest buzz right now. Those other things I want to do? Like doing more speaking work, building that web based app I think will go off and running another marathon? If they happen, it will have to be by the by. I don’t have the time I need to push for those things right now. All my pushing is saved for writing. For some people, ambition goes out the window for a while after the birth of a baby. Not me. For the first year of my #2 bubba’s life, the drive was still there to achieve … something. And I fretted that in taking time out to enjoy her, I would be missing out on … something. That others would be forging on ‘ahead’ of me. And I had to remind myself that it did not matter what others were doing. So I made a really conscious decision to ‘float’. To curb the natural urge to push. I gave myself permission to only do what I could do, when I felt up to it. And you know what? That year passed in a heartbeat. And at the end of it, I didn’t really feel like was behind the eight ball at all. Best of all – I really enjoyed my littlest one’s first year. I think a major factor in being able to successfully ‘float’ was being at peace with the fact that yes, I was going to miss out on stuff. Initially this was hard because just about every opportunity that’s come my way in life has been the result of first working hard … then being in the right place at the right time to take advantage of that hard work. 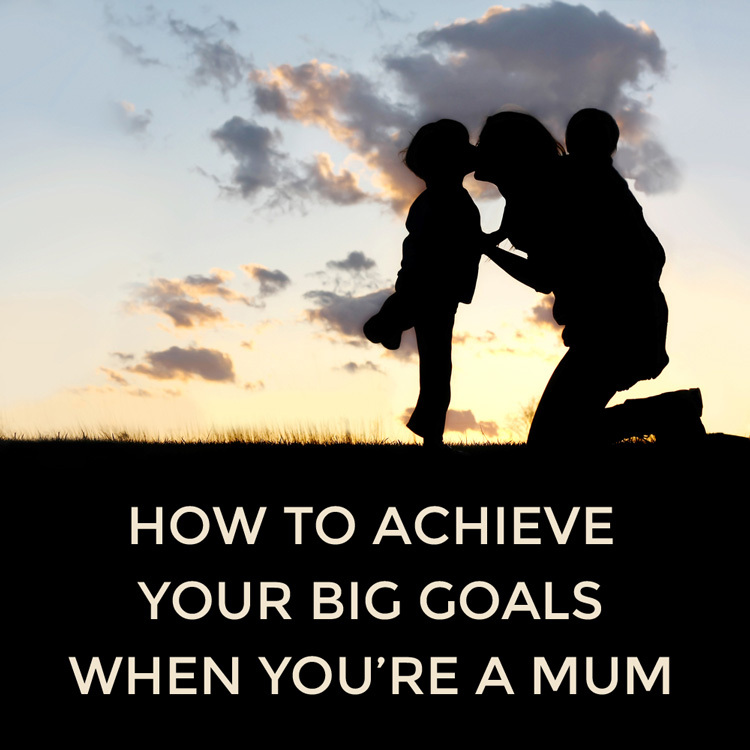 When you’re a mum however, your opportunities to be in the right place at the right time are a bit limited. So we miss out on stuff. A lot of stuff. This is the biggest thing I’ve learned when it comes to achieving big goals despite all the responsibilities and lack of time I have. My big, overriding goal is to publish enough books over the next three to five years so that by the time both my kids are at school, I’m generating enough income from those books to be able to cap the amount of work I have to do. I want that work to fit comfortably into my kids’ school hours so I’m able to be there for them when they are home from school. When you know what your big picture goal is, that knowledge informs all your decisions. It dictates what you say yes to, and what things you knock back. It drives you to carve out little pockets of time where and when you can. It also allows you to be a little less frustrated when you can’t. Do you find it hard prioritising which goals to chase with the limited time you have on your hands?